Attending college for music is, undoubtedly, one of the most powerful and influential investments of a young musician’s career. And why wouldn’t it be? In a great music school, a student is provided opportunities to work with accomplished college faculty, perform under the direction of esteemed conductors and music directors at the forefront of academia, and network with student and professional musicians alike. That all said, I consistently see location of the school being majorly overlooked by my college consulting students looking into college for music. Quite the extremes we see. The truth is, many of the best music scenes in America actually exist in college towns. Prominent music festivals, symphonic orchestras, jazz bands, independent music labels, rock and roll scenes, and of course excellent college music programs reside in many of the nation’s finest college towns. Having these be an integral experience of an education can be important to the life experience of many musicians. Because a student’s four years in an undergraduate program provides an unparalleled opportunity to network with musicians and audiences, which can open the door for career opportunities down the road. For this list, I looked only at college towns that have prominent music schools. I also excluded major cities that are too large to be college towns. While New York and Austin have incredible music scenes, they are too large to be considered true college towns. I also looked at the activity and the life of students in these cities. What is life like in and out of the main music campus; how are the sports, extracurricular activities, arts scenes outside of music (dance, theater, visual arts), etc. Certainly, I considered musical factors aforementioned, such as the prominence of major festivals, venues and record labels, classical and jazz ensembles, etc. Anything special about the town I also plan to note throughout this article. One of the college towns, for example, provides a full college scholarship to students who grew up in that town. Talk about an incredible promise! Finally, I added in what is my several years of observation having traveled at one point or another to many of the world’s finest music institutions. So without further ado, here are the top 10 college towns for music majors in the US. Ithaca has a surprising diversity in its eclectic music scene – it is home to a healthy variety of musical traditions ranging from folk, classical, and jazz styles. Ithaca hosts the city-beloved Cayuga Chamber Orchestra, a professional ensemble that has, since its inception in the mid-1970s, performed 100s of concerts to the upstate New York community at large. The music festival community in Ithaca is exceptionally vibrant. The Finger Lakes GrassRoots festival, which is held every year just outside Ithaca, draws tens of thousands of concertgoers seeing artists as notable as Los Lobos &amp; Ani DiFranco. Ithaca is home to one of the top liberal arts colleges housing a school of music in the country, the Ithaca College School of Music, making the institution ideal for music majors looking to gain a great education in music while maintaining a steady workload of academics. One of the most noted majors at Ithaca College’s School of Music is Music Education, which is the training of musicians to teach in the K-12 public school systems. Alumni from Ithaca College’s School of Music can be found teaching in schools, directing youth ensembles, and participating within the diverse array of musical and cultural festivity Ithaca has to offer. Home to the Western Michigan University School of Music, Kalamazoo is a college town filled with artistic intrigue, a hip music scene, and one of the finest jazz programs in the country. Let’s talk about that jazz program. Western Michigan University’s jazz program is among the most distinguished in the country, having garnered over 100 Downbeat Magazine awards since the early 80s. Students in the jazz program have the opportunity to meet the world’s most notable jazz musicians; Esperanza Spalding and Wynton Marsalis are just a few of the noted people. Outside of the jazz program, the school is noted for many of its classical music departments; many of the finest classical performers and composers in the state of Michigan and beyond flock to Western Michigan University’s increasingly competitive program. For musical activities outside of the university, Kalamazoo is second-to-none for many of its historic festivals. One of these festivals is the Irving S. Gilmore International Keyboard Festival. Among the finest of sophisticated music festivals in the US, the Gilmore Keyboard Festival featured, in 2016 alone, artists as fine and diverse as Yefim Bronfman, classical pianist, and Tony Bennett, one of the world’s most beloved jazz vocalists. Additionally, Kalamazoo is home to the Michigan Festival of Sacred Music as well as the very prominent Stulberg International Strings Competition. Interesting fact: platinum-selling band The Verve Pipe started in Kalamazoo in the early 90s. As a mainstay of disparate cultural events, Kalamazoo is unrivaled in terms of its cultural offerings for young artists. For example, the city’s Arts Council stages a monthly event known as “Art Hop.” Art Hop is a unique collaboration among businesses, galleries, and artists looking to display creative works by local natives. 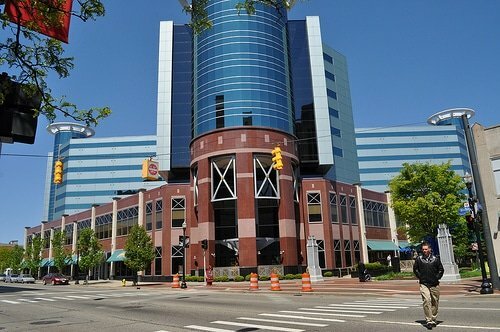 Among the most noted are the city’s State Theatre, WMU’s Miller Auditorium, The Union, a world-class jazz club that has an official partnership with the Western Michigan University School of Music, and the Wings Event Center, which is actually a 5,000+ multi-purpose venue with a hockey rink. One notable fact about Kalamazoo is that is just about as far away from Chicago as it is from Detroit; about a 2.5 hour drive to each. This could be a benefit for students who are looking to occasionally participate in the musical life in either of these prominent American cities. For students who are residents of Kalamazoo, a full-tuition scholarship is paid for by the city of Kalamazoo should the student be accepted and attend any public college in the state of Michigan. Seeing that Western Michigan University is a fine musical institution encapsulated within one of the most vibrant college towns, a student growing up here should seriously consider taking advantage of the town’s unmatched resources for what would be an outstanding college music education. Greeley, Colorado is a big one. UNC’s Lab I consistently wins the “best college jazz band” award from downbeat magazine, and the UNC/Greeley Jazz festival had over 5000 performers last year. Thanks for your article – I am a grad of the NT School of Music from long, long ago – makes me proud to read your words. My home town! Sweet as apple pie. Thanks for the yeeha Mr. Zuckerman. Of course I wanted my children to see the world, so twin A went Oberlin & Northwestern.. twin B went De Paul & Rice University … this city is amazing… & our girls visit the Hellhole They Grew Up In, quite often. Peace. Nice write up. Just a note, though, on the Kalamazoo Promise. The way you wrote it makes it sound like the town must be extremely highly taxed, to be able to fund such a thing. This is not the case. While the city may administer it (I don’t recall specifics), it is funded by a donor who chose to remain anonymous. There are many wealthy families in Kalamazoo due to the prominence of the pharmaceutical industry, and their donations help to provide such great opportunities to students of the arts. The Kalamazoo Promise is a separate nonprofit that is funded by anonymous donors. We administer this scholarship for Kalamazoo public school graduates. Great article and a great community. Wonderful commentary on Denton! I am not a musician, but I went to college there in the 80s. FYI, it is not a “suburb.” It’s a county seat with a history and identity of its own. Yes, Denton is a great city! I am a visual artist in a family of professional musicians. I graduated from UNT with a BFA in Visual Art. When I was a student (and later taught there) it was the largest Art School in the country, with great professors who were highly successful in New York and worldwide. How could you overlook Bloomington, IN? Top ranked music school, several music events every night, great night life, opera productions better than most professional opera companies, world famous performing groups, national music tours come through, major sports (basketball, football, etc. ), enormous marching band, beautiful campus, short drive to major cities, huge fraternity and sorority houses, brand new music school building, huge art community, world renowned professors, phenomenal dance and theater programs, big visual arts community, Straight No Chaser, etc. University of North Texas’s Jazz program rocks. And I would point out that the great write-up on the school makes a small error. As of 2016, the premier jazz ensemble at UNT, the One O’Clock Lab Band now has 7 Grammy nominations (not 6)! While I heartily agree with the story on Denton (although it’s much more than a suburb–and it’s “north of ordinary”)–you left out the fact that its close proximity to Dallas and Fort Worth provide opportunities for students to get gigs with performing arts organizations in addition to school-sponsored concerts and opera performances (people drive from Dallas and Fort Worth and beyond to see opera here). Additionally, many soloists and ensembles in the UNT College of Music enjoy hundreds of performing opportunities off-campus, as they are the go-to source for parties, fundraisers, weddings, receptions, churches and myriad other instances where people hire musicians. For example, need a Mariachi band? How about a steel drum ensemble for a tropical-themed event? String quartet for an art exhibit? Extra brass for Christmas Eve church services? Call the College of Music. Many faculty are also regular performers with the symphonic and opera companies in the Metroplex, enriching the experience for all. Full disclosure: I’m actually on the Journalism faculty at UNT but my husband and I are also musicians and we have many friends (faculty and students) in the College of Music. Great article on a great school! Although I was not a music major, the music scene kept me there longer than I planned before graduating. On any given night in a number of small venues you can hear fantastic musicians playing all kinds of different music.